Out on the western edge of San Francisco stands the California palace of the Legion of Honor. 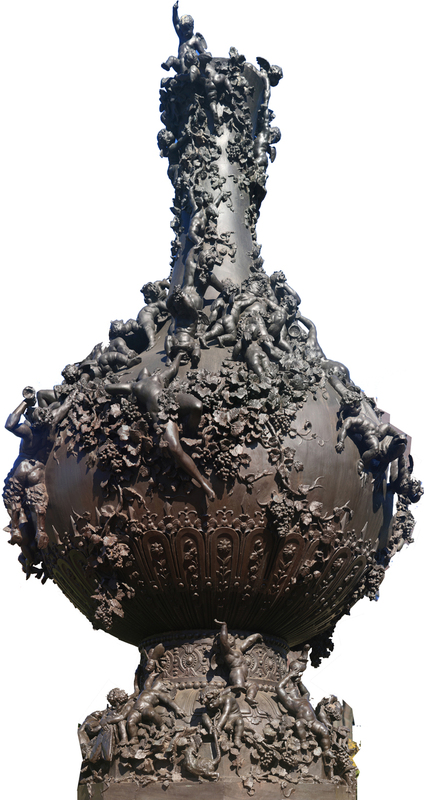 Walking through its austere portals and into the central exhibit hall, the visitor is confronted with a wild fantasy in bronze: the Doré vase, a gigantic, eleven foot tall bronze bottle covered with a profusion of satyrs and cherubs, oversized insects and nubile women. Who would guess that this colossal work would grace three world’s fairs before finding a quiet and dignified home in San Francisco? The story if the Doré vase is a Victorian melodrama: a tale of passion and rejection, humiliation and rescue. The fortunes and misfortunes of this marvelous work give us glimpses into the dreams and disappointments of its creator, and reveal the nature of the city that finally gave Doré’s masterpiece the seat of honor it deserves. Gustave Doré (1832-1883) was a talented and celebrated illustrator who aspired to be recognized as a serious artist. His illustrations for Dante’s Divine Comedy, Tennyson’s Idylls of the King, Cervantes’ Don Quixote and many other masterpieces of literature were highly acclaimed for their combination of imaginative power and meticulous craftsmanship. Gustave Doré put his highest aspirations and fonest hopes into this work. He labored night and day, day and night, sure of his imspiration and hapy in his fancy, alternatively excited and soothed by those fast-coming, ever-flowing illusions which characterized his every new ambition. He planned, sketched, modeled, even moulded his work, and his time for some months was absolutely given up to “The Vine,” as well as the material results of his other mental and manual labour, which were lavishly devoted to the composition and execution of this masterpiece. Perhaps one reason for Doré’s feverish haste was his desire to complete the work for the Paris Universal Exposition of 1878. The final bronze version could not be finished in time for the show; so a plaster cast, tinted green to simulate a patina, was put on display in the garden court at the fair. The vase received no awards and found no buyer, probably because a plaster casting, however skillfully disguised to resemble bronze would not be considered a finished work of art. 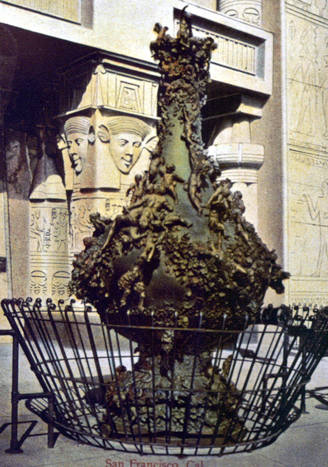 The Paris Exposition of 1878, where Doré would first show his "Poem of the vine"
The task of casting the vase in bronze was given to the Thiebaut Brothers foundry in Paris. The bill for the completed work was enormous: 60,000 francs, or about $12,000 in American currency at that time (approximately the equivalent of $195,000 in the year 2000). But considering the large size and delicate detail of the work, the price probably represents a fair index of the effort expended by the Thiebaut foundry in producing a flawless final work. The “Poem of the Vine” stands eleven feet high, measures almost seven feet around, and weighs three tons. In addition to the basic form of the vase itself, close to 100 separate figures – cupids, bacchantes, snakes and lizards, grapes and leaves, satyrs and Silenus – adorn the surface. At first glance, “Poem of the Vine” appears to be a chaos if crawling, climbing, and sliding vines and creatures. So much miniature vitality seems to surge from the surface of the vase that we are apt to forget that Doré called this work a poem. In a sense, the constituent shapes of the vase itself form the “cantos” of the poem: the octagonal base, atop which cherubim fight the animal and insect enemies of the vine; the decorative band that separates the battle at the base from the bacchanalia on the globular body of the flask; and the progression from the widest circumference up to the lip. The groups of figures form the “stanzas” of these cantos, which, taken together, form the narrative line of “Poem of the Vine.” Individual expressions, gestures, and bodily attitudes are the separate lines that make up the parts if each stanza-grouping. There is indeed a poem here; but it is a poem told in metal, not words, and we should beware of drawing too literal a tale from the Doré vase. Recognizing the limitations of “translating” a bronze into words, we can discern some elements in the work that justify its title as a poem. First and foremost, the vessel is a work of fiction: it represents a wine flask – a colossal flask of mythic proportions, a bottle for giants and gods. Doré loved to evoke the gigantic in his illustrations; but there, the small size of even the largest book page limited him to merely suggesting grandiose dimensions. In bronze, the eleven foot high vase conveys a corporeal reality that fairly overwhelms the viewer. In size alone, the Doré vase is an epic. But it is a comic epic, a “Battle of Frogs and Mice” rather than an “Iliad.” Though the vase is oversized, the human and humanoid figures that crawl and sprawl over its surface are miniatures. At the base, however, flies and spiders assume gigantic proportions as they wrestle with the cherubs. Even there, though, size reversal is capricious: a fly is larger than the rat who chews at one of the leaves. Around the middle of the vase, the traditional effects of drunkenness are graphically depicted. The cherubs who stand for the spirit of the vine assist in the revel. Some goatfoots and women wallow in the good feeling of inebriation. One satyr lies sprawled across a lovely female, “ready to twitch the Nymph’s last garment off.” Another raises his arm to strike in anger. One nymph sits quietly “in her cups’ as the cherub-spirit beside her aids in the meditation. Each group is a stanza on the effects of the vine on men and women, separately and together. The top of the vase only the cherubs can reach, though several humans yearn to rise above the revel. From insects to half-humans to humans to cherubim – the progression upward on the vase is a kind of chain of being, with the highest at the mouth of the vase – the source of ethereal inspiration – far from the animal and human struggles below. The total visual effect of “Poem of the Vine” is one of lush, rich enjoyment. We can stand close and relish the episodes of the figures; or we can stand back and savor the beautifully-shapes green-gold effect of the whole. “Poem of the Vine” is like a bottle of wine itself, to be tasted in sips, yet enjoyed as a complete experience. With the bronze casting complete, Doré could show the world what he was capable of in sculpture. The vase went on display in the Paris Salon of 1882. Once again, the French public paid no attention to the “serious” Doré. “Poem of the Vine” won no awards and found no buyer at the Salon. Through the personal influence of M. Bardoux, the French Minister of Fine Arts, Doré was presented with an award – an honor that today seems mysteriously prophetic. We will speak of this award at a later point. 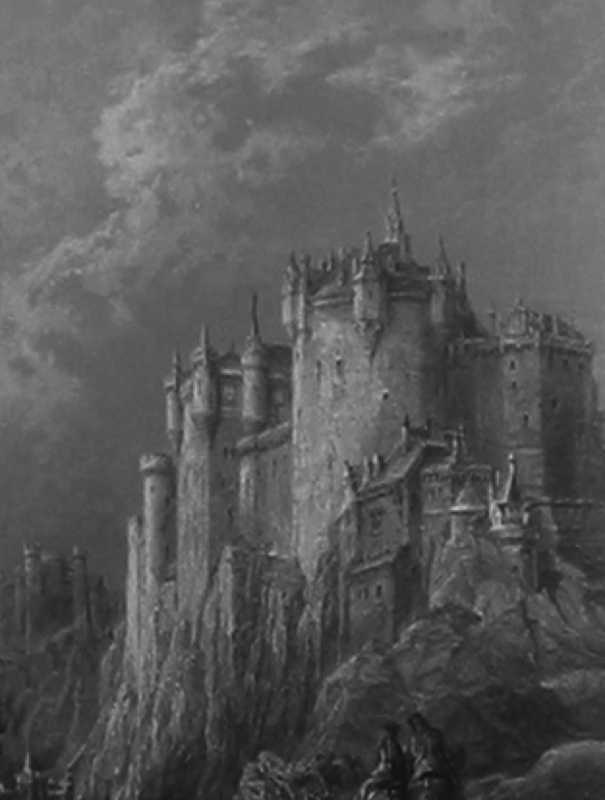 Doré died in 1883. Angina complicated by asthma, disappointment over the failure of “Poem of the Vine” to find acceptance, and sorrow at the recent death of his mother, all combined to speed Doré to an early grave. AT the time of his death, the Thiebaut brothers had not been paid for their work. Probably Doré expected to pay them with part of the proceeds from the sale of the vase. Doré’s heirs did not honor the debt, and the “Poem of the Vine” went back to the Thiebaut Brothers Foundry after the estate was settled. What a humiliation for this work into which the artist had poured his “highest aspirations and fondest hopes”: rejected by the public, rejected by Doré’s own heirs, and returned to the warehouse of the foundrymen as an unwelcome repossession! Ten years went by without a buyer for “Poem of the Vine.” Finally, in 1893, the Thiebaut brothers seized a likely opportunity to sell the vase. Chicago was hosting the Columbian Exposition that year, and America had always received Doré’s work well. So the case was sent as part of he French exhibition ensemble; but again, no one wanted to purchase the work for the asking price of 60,000 francs. The 1893 Columbian Exposition in Chicago, where the Thiebaut brothers hoped to sell the "Poem of the Vine"
However, the “poem of the Vine” did attract the attention of a man destined to become the patron of the vase: Michael de Young, editor of the San Francisco Chronicle and Commissioner of California exhibits at the Columbian Exposition. The Doré case became part of De Young’s ambitious scheme to host a world’s fair in San Francisco in 1894. America was suffering through a depression in the early 1890s. De Young watched the crowds that poured into Chicago for the fair, spending lavishly and revitalizing the economy of the city, and decided that San Francisco could reap these benefits with a fair of its own. With dazzling speed, de Young raised the money and public support for the venture, and arranged for many of the best exhibits at the Columbian Exposition to be brought to San Francisco. Thus armed with public support, De Young put himself into his best bargaining mood and called in the Thiebaut brothers to negotiate the price for the vase. The foundrymen were still 60,000 francs in arrears for the cost of casting the bronze plus the costs of storage expenses. They apparently set the value at 80,000 francs -- $20,000 – but were willing to settle for the original 60,000 franc figure in order to recoup their original debt. De Young argued for a lower price; and at a critical point in the discussion, De Yooung reached into his pocket, extracted 50,000 francs, and coolly spread them out on the table. “Take it or leave it, gentlemen,” was the newspaperman’s final offer. Seeing 5/6 of an old debt so tangibly close for the grasping proved too much for the Thiebaut brothers. They took it, and Gustave Doré’s “Poem of the Vine” had finally found a home. For many years after the Midwinter Exposition, “Poem of the Vine” was on display in front of the Fine and Decorative Arts Museum in Golden gate Park. In some ways, it might seem wildly incongruous to place a huge Victorian vase decotaed with classical motifs in front of the Egyptian Revival style art museum. But, seen from the vantage point of the taste of the nineteenth century, there was an imaginative consonance between the sculpture and the building. An Egyptian temple was a repository of treasures from all over the world, and so could include any and all styles within it without contradiction. In addition, both the vase and the museum were evocations of decorative art: the vase with its encrustations of mythological and animal life, the museum with its hieroglyphics and reliefs set onto a core of structural iron inside the walls and pillars. The original plans of the Fine Arts Museum directors called for making the “Poem of the Vine” into a fountain, but the scheme wass never carried out. When the annex to the Fine Arts Museun – the recently destroyed De Young Museum – was completed in 1918, the vase was moved inside the new structure into the Hall of Statuary. There it remained until 1976, when the vase was moved to the central hall of the California Palace of the Legion of Honor, At that moment, almost exactly 100 years from the time Doré first thought of creating “Poem of the Vine,” the prophetic act of M. Bardoux came to fruition. Fighting public indifference and critical hostility, Bardoux obtained for his friend the rosette of Officer of the Legion of Honor for his work on the vase. It was Doré’s first major honor since he received the Cross of the Legion of Honor in 1861 for his illustrations of Dante’s Inferno. The Legion of Honor Rosette was the last major award of his life. How fitting it was, therefore, that his vase should stand in the very center of the California Palace of the Legion of Honor in San Francisco, the “Paris of the West”! Postscript: Since this essay was published, the Poem of the Vine has been moved from the Legion of Honor to an outdoor location by the DeYoung Museum.